First, thank you so much to all of you who visited me at the Three Little Birds Market on Saturday. It was wonderful to meet you and chat for a bit! And so many of you who couldn’t come still wished us well and that means so much to me. Guy in the Garage and I had an amazing time and I’ll be sharing a recap of the market soon. This post contains some affiliate links (at no extra cost to you) so you can easily find the products that I use and recommend. 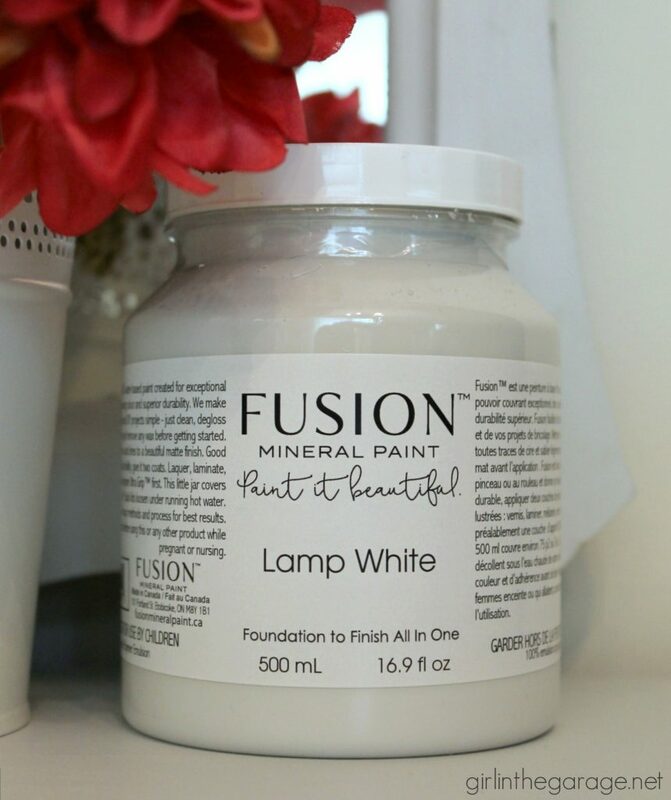 I used Fusion Mineral Paint in Lamp White for the first time… a very pretty pale gray/white mix. You can order from several different designs (available HERE on Amazon) – and you’re sent a plastic sheet with inked words/designs. 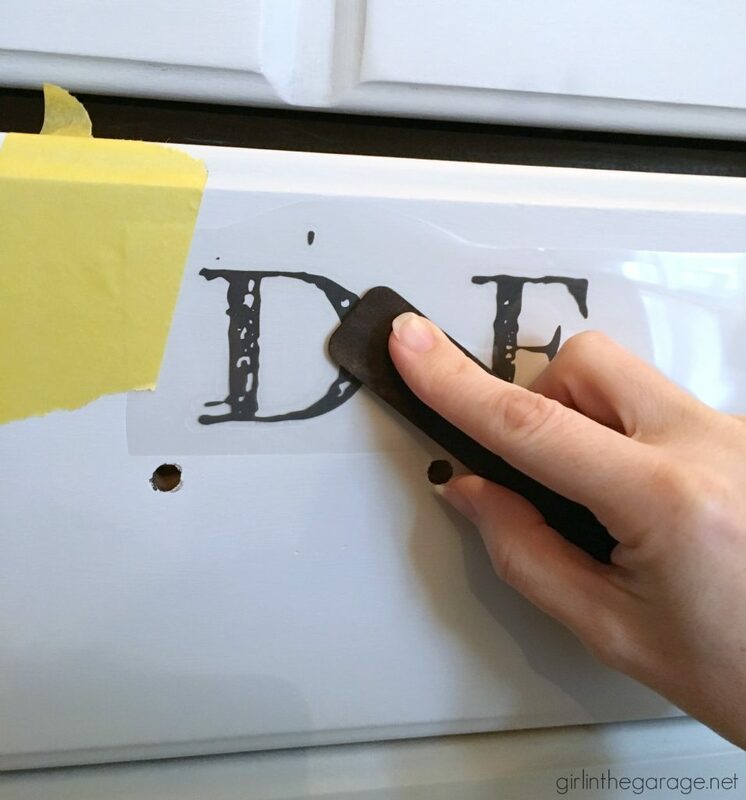 You can cut the plastic to your desired size (I cut a huuuge one into smaller pieces, so I can use the rest on other projects aka save money), then measure and tape it on with Delicate Surface FrogTape so you don’t damage the paint. The plastic graphic comes with a wooden stick and you rub over the ink repeatedly to transfer the image. After rubbing all over for 5-10 minutes (or longer depending on the size of your graphic), carefully peel away the plastic. If any of the letters stick to the plastic, lay it back down and go over it again with the stick. 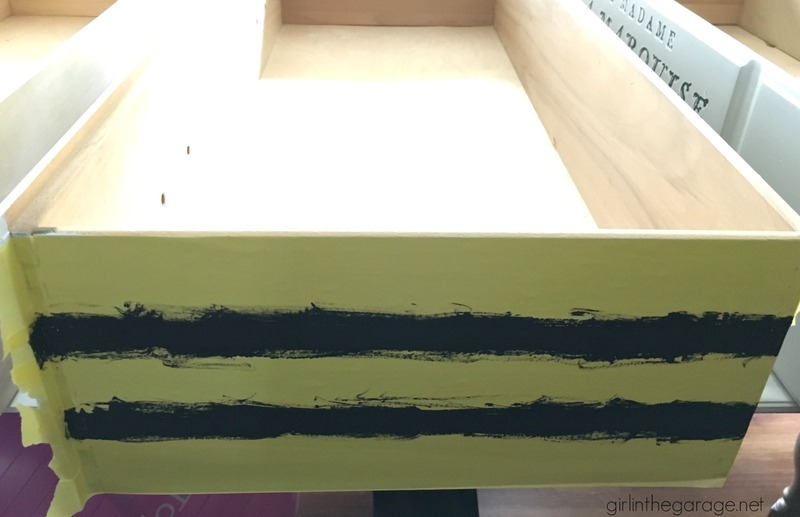 I used the FrogTape again to paint some thin stripes on the drawer sides. And I replaced the original hardware with new glass pulls (find similar ones online Here) for a more glamorous look overall. 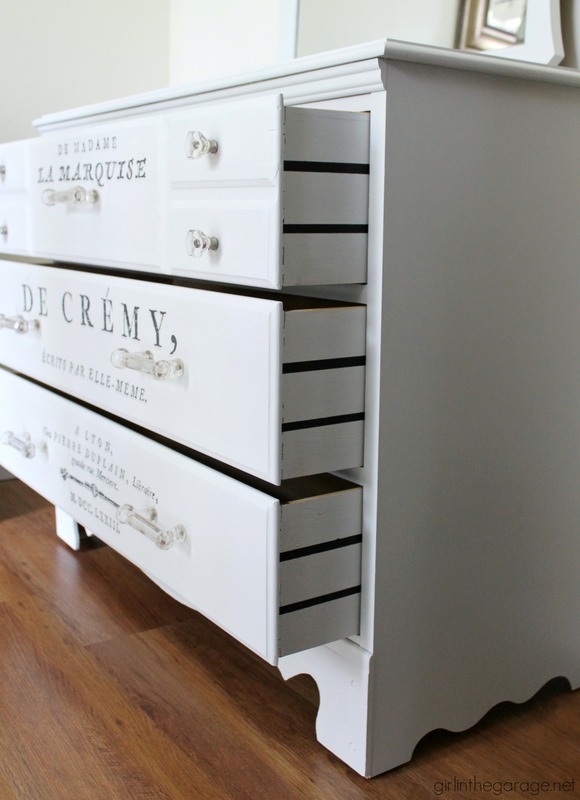 The drawer stripes add that extra surprise touch while still keeping it classy. 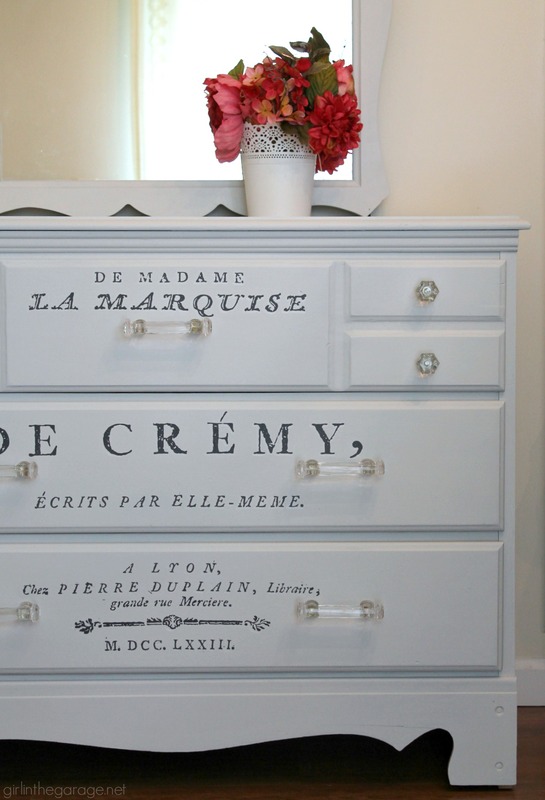 This vanity makeover is a night and day difference, right? We brought this to the market but it’s still available, so we’ll be taking it to my new booth at Antiques on Main sometime this week. Have you tried this easy image transfer technique yet? Let me know if you do, and what you think of it. (You can see all the different designs HERE.) I have another project using a different one of these graphics that I’ll share with you guys soon! Jen- Love this look! I like how you broke up the stencil. 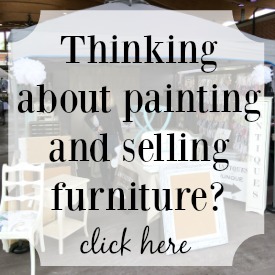 Where do you buy your Fusion Mineral Paint? are you sure it is the same piece? Just kidding, it turned out so nice and the glass knobs take it up a notch. Looks great! 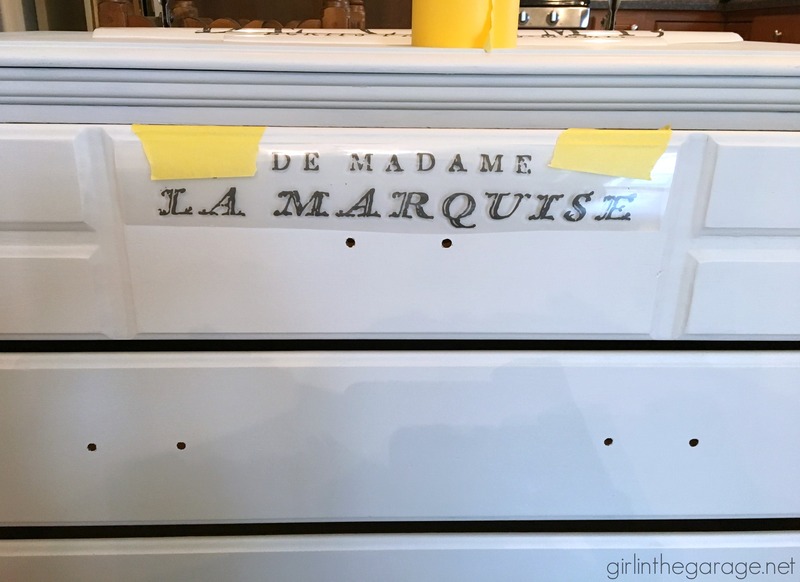 Would you share how you prepped this piece for paint, please? I have found those old pieces and the finish on them to be hard to get good coverage. Thanks! Thank you Heidi. With this type of finish I didn’t have to worry about any bleed through, and Fusion Mineral Paint doesn’t require much prep – just light sanding as needed. I filled a few small marks with wood filler and did a little sanding and that was it! 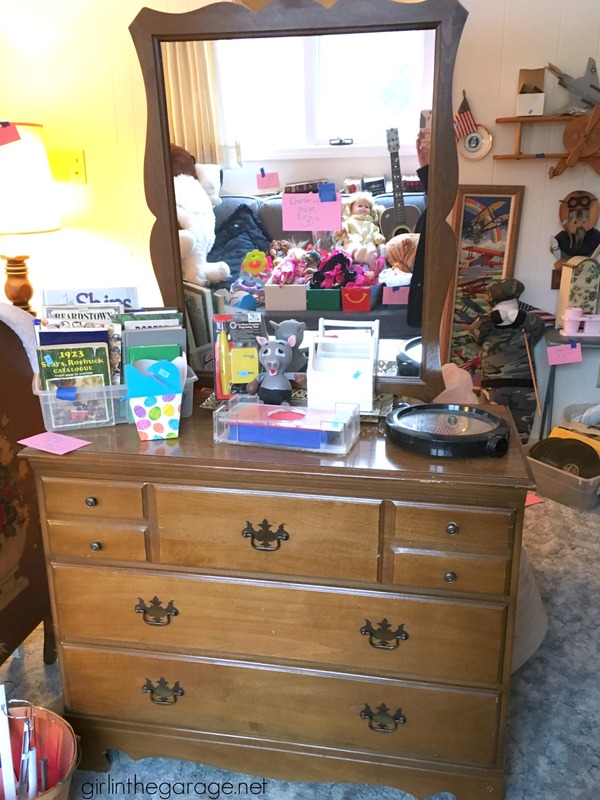 Beautiful makeover, Jen – quite the difference between the before and after! Pinned. 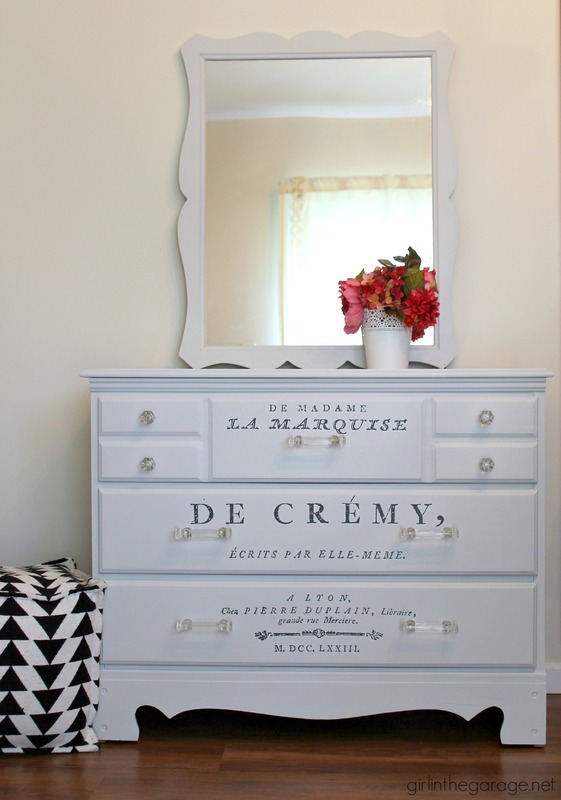 I’ve seen those graphic decals and dying to give them a try. Do you know if they work on glass? It is definitely an improvement. 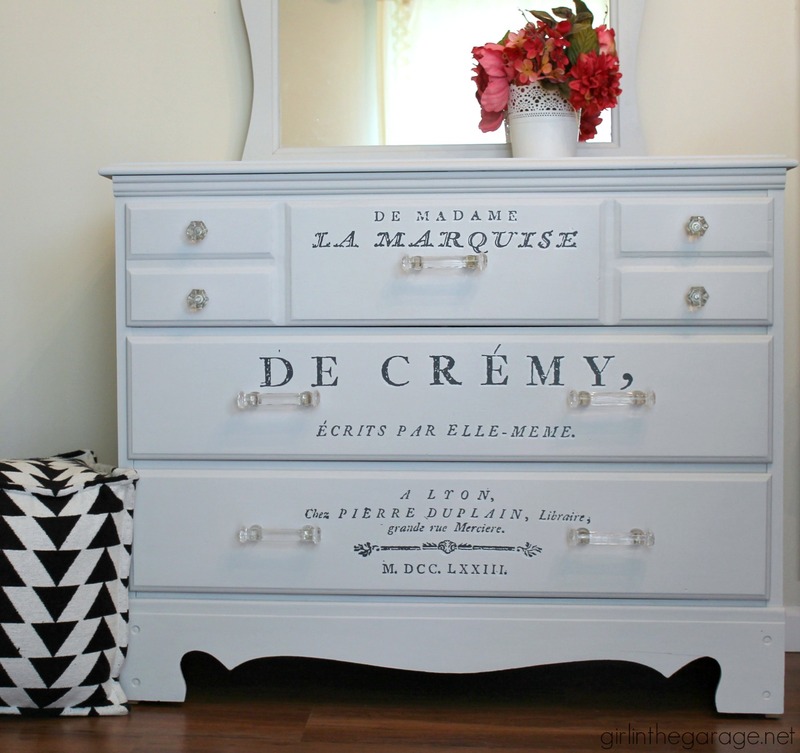 Do you put some kind of sealer over it so the letters would not be damaged? Great work Jen, I really love the new look. Looks Great! I looked up the transfer you used but it appears that the one you used was much larger than the 11X14″ on Amazon. What size transfer did you use? Thank you Vicki! You’re right, mine was about 27×36. That size may not be available on Amazon right now. You can also do a search for Iron Orchid Designs and you might find them on other websites – I always recommend Amazon just because of the free shipping. Hope that helps! Hi Jen! This dresser looks really good! I was wondering how many coats of white paint it needed? What prep did you do? From my experience that wood and top coat from way back when don’t take paint well. Any advice? Thank you! Hi Heidi, sorry for the delay in responding. I think I did 2-3 coats of paint, and the only prep was some light sanding and I filled a little gash with wood filler. Fusion Mineral Paint doesn’t require much prep, which is a definite plus! Fab work. You have a great eye.